By Chris Williams: Errol Spence Jr. didn’t have much to say about Terence Crawford’s demolition job last Saturday night in beating WBO welterweight champion Jeff Horn by a 9th round knockout, but he did let the boxing fans know that he’s watching him by posting a meme of a person wearing a monocle. Crawford (33-0, 24 KOs) made his first appearance in the 147 lb. weight class last night in beating an over-matched Horn (18-1-1, 12 KOs) in his second defense of his World Boxing Organization welterweight title at the MGM Grand in Las Vegas, Nevada. Spence, 28, wants to unify the welterweight division and then move up to 154 to unify that weight class as well. Spence’s first target is to go after the winner of the Danny Garcia vs. Shawn Porter fight for the WBC welterweight title. Spence expects to be able to fight the winner of the Garcia-Porter fight next after he takes care of his International Boxing Federation mandatory challenger Carlos Ocampo on June 16 at The Ford Center at The Star in Frisco, Texas. Horn would have likely been knocked out quickly by Spence last night if it had been him inside the ring. Spence would have walked Horn down and knocked him out quickly, but then again, he’s bigger, stronger and more of a knockout artist than Crawford. Spence is a huge puncher, who could be fighting at 154. Crawford is a true welterweight, and he’s only now fighting in his natural weight class after spending his entire career melting down to 135 and 140 to have a size advantage over his smaller opponents at lightweight and light welterweight. Errol would have walked Horn down and knocked him out within 4 rounds at the most. It took Crawford nine rounds and a premature stoppage for him to get him out of there. If not for the referee Robert Byrd stopping the fight in the 9th round prematurely, the fight likely would have made it to the 10th and perhaps even the 11th. Crawford landed 155 shots on Horn, and yet he still couldn’t knock him out without the referee Robert Byrd stepping in and stopping it prematurely. Had that been Spence landing even half that amount of shots on Horn, he would have surely gotten him out of there quickly and efficiently without any questions asked. After the way that Crawford, 30, dealt with Horn, a lot of boxing fans are saying today that he’ll beat Spence when the time comes for them to face each other. I don’t know about that. All the things that Crawford was getting away with last night against the crude-brawling Horn would be things that he couldn’t do against Spence without paying the price. 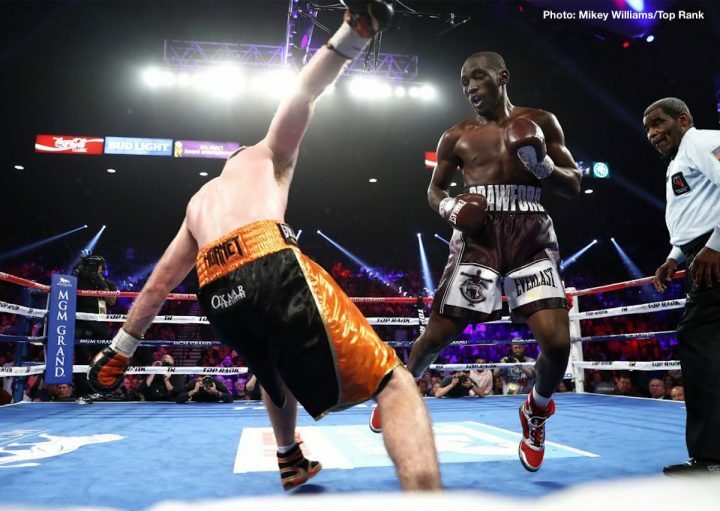 Crawford showed a good ability to get out of the way of Horn’s head shots, but he may not be able to avoid the body shots from Spence or the jabs. Crawford’s promoter Bob Arum looked like a big kid who got his Christmas present in talking about his future after the fight. Arum said that he sees Crawford as being similar to Sugar Ray Leonard in his fighting style. I’m not sure that I agree with Arum, but I’ve seen a lot of Leonard’s old fights recently on Youtube, so I have a fresh memory of how Sugar Ray fights like. Arum’s memory of Leonard might be a little foggy, as he’s a completely different type of fighter than Crawford. They have absolutely nothing in common at all. If Arum wants Crawford to become more popular by name dropping Leonard’s name in drawing comparisons, I think he’s wasting his time. Arum might as well be comparing Crawford to Muhammad Ali and Sugar Ray Robinson, because he would be equally out there in outer space with those types of crazy comparisons. I don’t think Crawford fights anything like Leonard. The speed of Leonard when he was in his prime was far better than Crawford, and he was more of a combination puncher. Crawford is a pot shot counter puncher, who spends a lot of time changing fighting stances, running around the ring, sticking his tongue out at his opponents. Leonard wasn’t about all that. He was more interested in fighting, throwing combinations, and standing his ground. Even when fighting the 6’2” knockout artist ‘Hit Man’ Thomas Hearns, Leonard stood his ground and fought him. If Crawford fought Hearns, he’d have been on his bicycle, looking to stay out of his way as much as possible to avoid getting hit. I think it would have been very boring to watch Crawford fight Hearns. Arum is dead wrong in his comparison of Crawford to Leonard. I couldn’t think of a worse comparison if I tried. Jeff Horn was little more than a weak B-level guy with MAJOR flaws in his game. When Crawford has to face an A-level fighter like Spence, it’s going to be a different story. I see Crawford getting broken apart by Spence’s power and end up getting stopped in the same way Kell Brook, Chris Algieri, Leonard Bundu, Chris van Heerden and Alejandro Barrera were. Those were guys that had done well against their opposition before meeting up with Spence. But once they get inside the ring with him, they were broken down and stopped in a neat fashion. Kell Brook is a bigger puncher than Crawford, and Spence was able to break him down and make him quit in the 10th. If that happens with Crawford, I hope Arum takes the blow well without going to pieces at seeing another one of his money fighters crumble to a million pieces. Arum’s longtime gravy train fighter Manny Pacquiao was beaten badly by Floyd Mayweather r. in 2015, and ever since then the money train hasn’t been the same. Arum still doesn’t have anyone that can step in and fill the void that Pacquiao left as the PPV attraction for Top Rank. Arum’s fighters Crawford and Vasyl Lomachenko are popular to a certain extent, but they’re NOT pay-per-view fighters and it remains to be seen if they ever will. Both are 30-years-old, and they still haven’t proven that they can become PPV guys.